Shiny orange graduation gowns, along with the matching graduation caps, are a striking choice and is most commonly worn by students who are receiving their degree in engineering. All of your hard work and dedication over the past few years has not gone unnoticed and it is time to celebrate your success! We have graduation ceremonies in order to honor each and every individual who has managed to reach this point. Even your family and close friends gather from all around to show their support for you as you complete this section of your life and begin a new venture. Your success did not come overnight, I'm sure you were faced with a variety of challenges and even though it may not have been easy you were able to prevail. Hopefully you not only made some fond memories to look back on but a lasting friendship or two as well. No matter what you need to get ready for your graduation, we have a large selection of attire for you to choose from, including package deals to help your shopping go as smooth and stress free as possible. Graduation has been a tradition for many years, it is typical for graduating students to dress in a graduation cap and robe in addition to their tassel or cords. We sell gowns individually or as a part of our cap & gown + tassel bundle deal allowing you to choose a different color cap if you wish. Whenever you buy a graduation cap from Honors Graduation we will throw in a tassel of your color choice at no additional cost to you. Our graduation gowns are available in a number of sizes to accommodate anybody from two feet 10 inches tall (size 24) up to nearly seven feet tall (size 66) include many plus sizes as well. If you prefer to have a matte finish as opposed to shiny for your graduation gown, each of the colors that we provide are available in both options. Not what you're looking for? Check out our Complete List of Graduation Gown Fabrics and Colors. 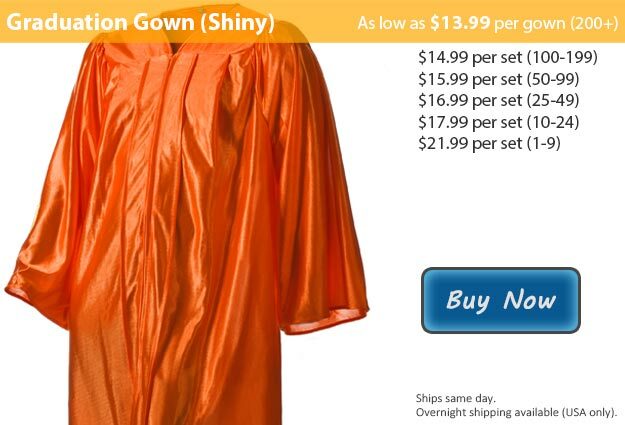 This graduation gown is also available in Orange Matte Fabric.